On this episode of ‘Homeless in San Diego: Real People, Real Stories,’ we welcome guest host Fiona King, Communications and Development Manager at Interfaith Community Services to the studio. 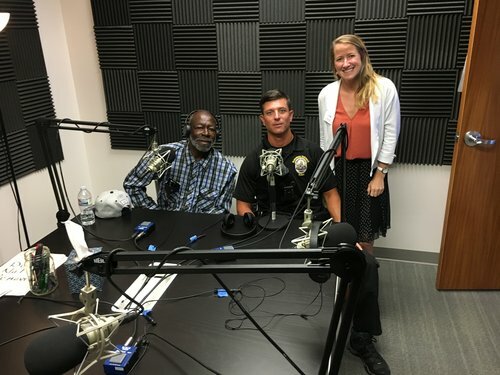 Fiona is joined by Josh Ferry of the Oceanside Police Department Homeless Outreach Team (HOT) to discuss the role his team is playing to help end homelessness in Coastal North County. A non-enforcement unit, Oceanside HOT serves to build rapport with homeless clients and connect those in need to social service agencies. Earlier this year, Josh met Jerry – who at the time had been living for the streets for 11 years. Jerry shares his struggles with homelessness, as well as how Josh and Oceanside HOT helped get him off the street and into an apartment of his own. Learn more about what your community is doing to end homelessness. Does your local police department have a homeless outreach team? What can you do to support them? Do your research and see how you can help your neighborhood HOT unit help end homelessness.